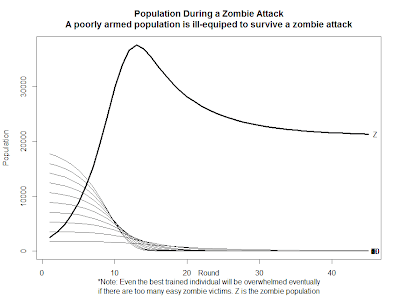 # I also wrote a Spatial Simulation of a zombie infection in Stata previously. # This simulation is a simple repeated matching simulation in which each agent is matched with a random different agent. # I believe this is an appropriate way of modelling a human zombie exchange as portrayed in the movies. Generally speaking, each encounter can be thought of as a probabilistic draw in which either the human becomes zombified or the zombie is permanently killed. 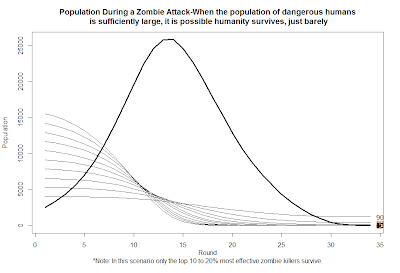 defined on a scale of 0 to 90 percentile with increments of 10 which reflect the chance of that human vanquishing a zombie that the human encountered or being in turn vanquished. # If a human is vanquished a zombie is added to the zombie population. # Frequency of each time of human from 0 to 90 percentile. # This number is only relative to the scale of the other frequencies so long as it is positive. # Thus if only type of human had a 5 then it would be 5 times more likely than a type of human with a frequency of 1. # frequency is the most important parameter choice in the model as will be seen below. # Bind the information into a single matrix. # Now we calculate what percentage of our start.humans are each type. # Finally we generate our moving things data. # Initially the only thing moving is humans. # Some percentage of the humans are initially infected. # Calculate the number initially that become infected. # Now we randomly select the humans infected initially. # -77 Is the number for a zombie. # After the intial infection phase peopole get their guns out and start acting defensively. # This command pairs up a vector. It is used to match humans with zombies. # Half the length of x rounded down. # This calls the previously defined function pairup to match two different individuals together. # This matches them by position in the walking.things vector. # This code will check if a zombie is in the right column and human in the left. # If so, the human and zombie places will be switched. # Resolve non-conflict. Zombies don't fight zombies and humans don't fight humans. # Finally, adjust the walking.things vector to adjust for the changes. # Count the number of rounds completed. 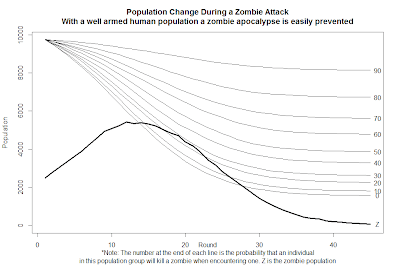 ylab="Population", xlab="Round\n*Note: The number at the end of each line is the probability that an individual\nin this population group will kill a zombie when encountering one. Z is the zombie population"
# However, this equal proportion of highely effective zombie killers to very ineffective zombie killers is nonrepresentational of a typical zombie movies or games. # I will instead rerun the simulation with a larger percentage of low ability humans. 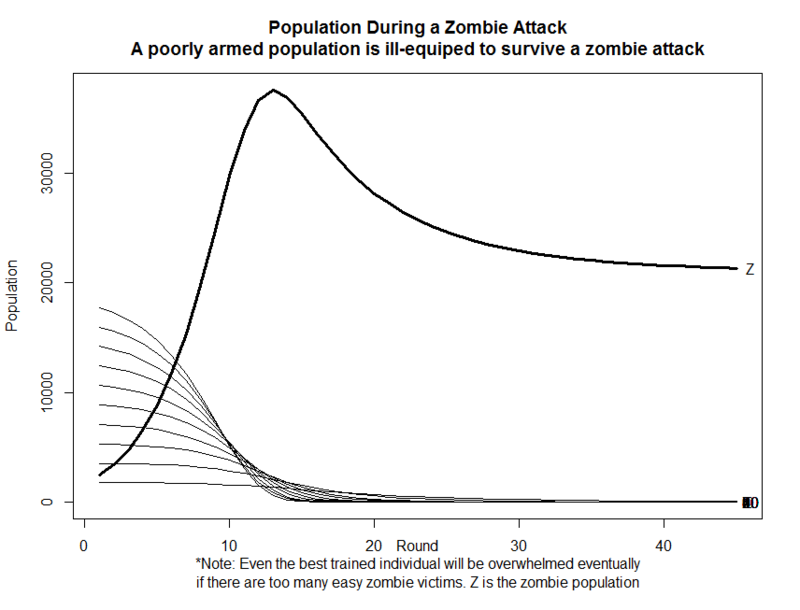 ylab="Population", xlab="Round\n*Note: Even the best trained individual will be overwhelmed eventually\nif there are too many easy zombie victims. 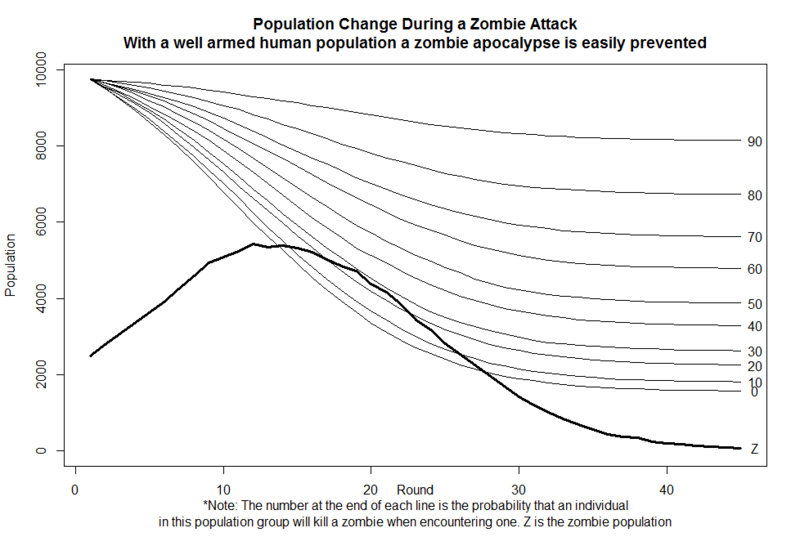 Z is the zombie population"
# Let's try one more variant with still more weak humans but a little better ratios. 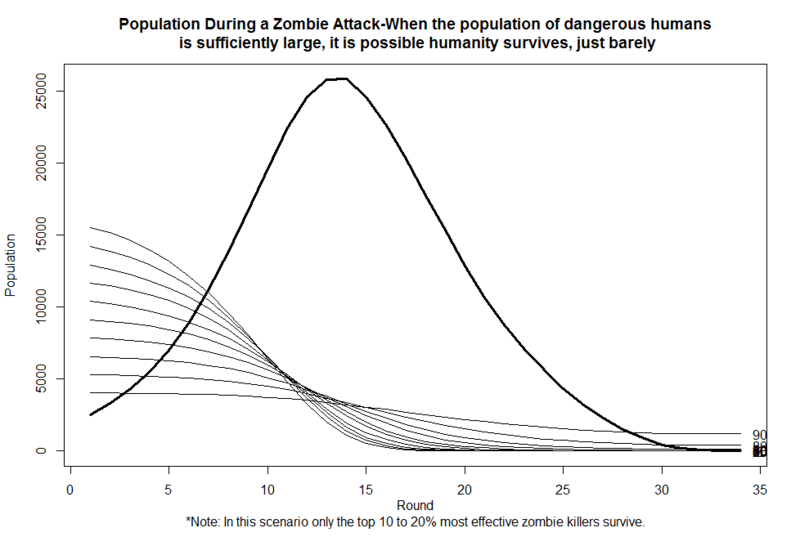 ylab="Population", xlab="Round\n*Note: In this scenario only the top 10 to 20% most effective zombie killers survive." # Overall conclusion? Mandating zombie defense classes is the only way to be certain humanity will survive.